Waste Prevention & Minimisation: Germany - Can worms add to global warming? Germany - Can worms add to global warming? Worms may not be as environmentally friendly as the growing number of gardeners who use them to help compost their kitchen scraps and grass clippings believe, say scientists.In fact, the greenhouse gases emitted by a large commercial worm composting plant may be comparable to the global warming potential of a landfill site of the same scale, according to the Open University. This is because worms used in composting emit nitrous oxide - a greenhouse gas 296 times more powerful, molecule for molecule, than carbon dioxide. Landfill sites produce methane which is 23 times more powerful a greenhouse gas than carbon dioxide. Jim Frederickson, senior research fellow at the Open University's faculty of technology, said: "We know from research in Germany that a third of the nitrous oxide emissions coming from the soil are associated with worms. "What we found from looking at large worm composting systems is that their emissions could be comparable in global warming potential to the methane from landfill sites." The Government has said it wants to increase the amount of waste that is composted to 40 per cent by 2010 and 45 per cent by 2015 - which is likely to involve more commercial scale worm composting plants. 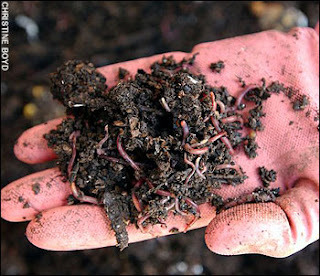 Red worms appear naturally in country compost heaps but over the past decade or so a thriving trade has grown up in domestic wormeries which enable people with space as limited as a balcony to compost their kitchen waste. Domestic wormeries are dustbin-sized boxes formed from several trays, with names such as Can-O-Worms, into which reared worms are introduced. Some are even made to look like beehives. The worms are laid out on lime and vegetable peelings. When they have digested this material they move to another level in search of more food. The lower trays of compost can be used and a tap allows the liquid collected to be drained off as fertiliser. The red worms used in composting are extremely efficient at breaking down decomposing material such as kitchen scraps and other organic material but they emit nitrous oxide in the process of digestion in the gut. Mr Frederickson told Materials Recycling Week said: "Everybody loves worms because they think they can do no harm but they contribute to global warming. "So the amount of nitrous oxide emitted by large scale worm composting is something we should be looking at before we go further down that route." Mr Frederickson said that the research he and his colleagues had done was on very large commercial worm composting "beds" which build up large amounts of nitrogen which is then emitted by the worms as gas. It is unclear whether the same process goes on to the same extent in domestic worm composting bins, but Mr Frederickson said: "We are clear they will be producing nitrous oxide but maybe not to the same extent. They may be more stable. "Worm composting bins and compost heaps produce really good compost in a decentralised way with no transport to landfill sites - which is a good thing. "But we must remember if we are evaluating this method against other ways of getting rid of wastes, such as landfill and incineration, that worm composting can also be a source of greenhouse gas emissions." UK - No market food gone to waste!